This exclusive Caribbean plantation style villa is crafted in hardwood and local stone and features an extensive private garden. From Trunk Nest Villa you have direct access, on foot to two stunning white-sand beaches that are the annual nesting grounds for leatherback turtles. Enjoy the wrap around decks or garden, all with extensive views and comfortable furniture for your evening drinks,dining, or simply spotting dolphins, leatherbacks, or super yachts. While you are having breakfast on the deck or in the garden, marvel at the hummingbirds enjoying their breakfast in flowering native trees and cultivated tropical flowers. You will enjoy the exclusively selected design features throughout all of Trunk Nest Villa.The Villa is carefully detailed in everything from plantation era door & window hardware, fine faucets in bathrooms and kitchen, and carefully selected Scandinavian furniture from mid-century design masters. If you are passionate about cooking, then you will simply love the attention put into the Grand Room kitchen, where a gormet range cooker is the center piece along with all the equipment and cutlery you or a professional chef could ever want! If you prefer to prepare your culinary creations outdoor, light the charcoal grill or simply put some gourmet chipolata hot dogs from French Deli and marshmallows from Relish Gourmet Store on the menu and prepare the garden fire pit. As you drive or walk into Trunk Nest, blooming hibiscus and bougainvillea, palms, and a wide range of tropical greenery greet your arrival through the hardwood driveway gate. The villa entrance is surrounded by tropical plants and local stone work. The 20ft+high-ceilinged Grand Room is at the heart of Trunk NestVilla. Here, a very comfortable sofa, a beautiful reading chair, and counter height bar-stools invite you to gather, and relax. The bar, made of local stone and hardwood, centered in the Grand Room kitchen, lets you enjoy everything from breakfast to cocktails. Enjoy an indulgent dinner sitting down at the oak dining table or choose to sit outside around the comfortable deck dining table set. If are able to take your eyes off the ocean and garden views, a55-inch 3D HD TV with Blue Ray 3D DVD player and Direct TV satellite, along with a surround system are ready for your entertainment. 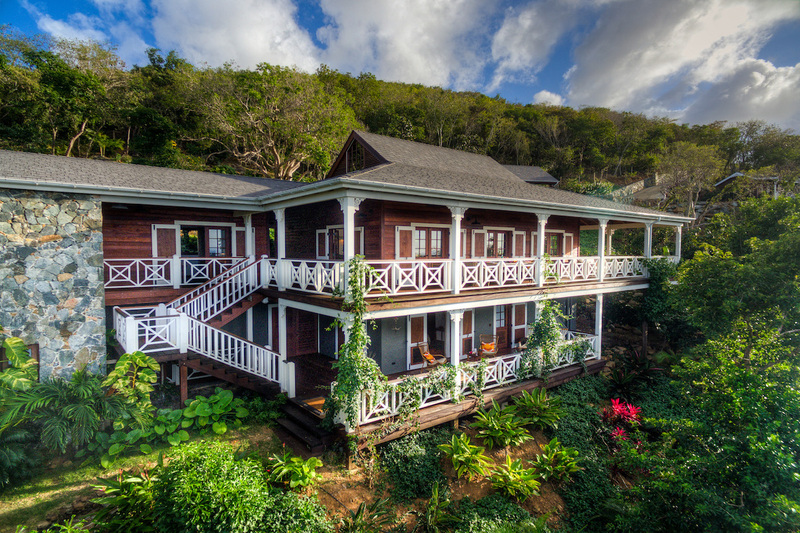 From the Grand Room, the multiple plantation style double doors open out to the comfortable and fully furnished wrap around decks which offer both ocean and garden views.The Grand Room is connected, via a roofed open deck, to the office, master bed & bath on the upper-level entry foyer. The master bedroom connects directly to it ?s own private ocean & garden view balcony, master bathroom, and office. A staircase from the main deck leads to Trunk Nest Villa ?s second bedroom. This bedroom has it ?s very own large ocean &garden view deck,with hammock and comfortable chairs, leading out onto the garden. The second bedroom has an en suite bathroom. For your sleeping comfort, both bedrooms have king-size beds with either Italian cotton percale bedding or Belgian flax Linen bedding. Both bathrooms are stocked with toiletries. An inviting, turquoise small plunge pool has it ?s own private setting on the property, reached by a short stone path through the lush gardens. Additional amenities include:ceiling fans in all rooms, air-conditioning in the bedrooms, laundry room, Sony®/Polk Audio® Home entertainment system,DVD movie collection, vinyl records, WiFi connection, Skywatcher Schott® Telescope and vintage board games. Although the Trunk Nest Villa, along with Trunk Beach and Rogues beach, are very private and tranquil, it is only a 20 minute drive from the airport and a 10 minute drive to Road Town’s bustling shops, restaurants, and ferries to take you to neighboring islands. Transfers are available at an additional fee.